Neil Mattson, Associate Professor in the Horticulture Section, has been honored in GPN Magazine’s 40 Under 40 Class of 2015 list. GPN (Greenhouse Product News) is the leading business publication for horticulture professionals. Class members were nominated by their horticulture/floriculture industry peers based on personal and professional accomplishments. 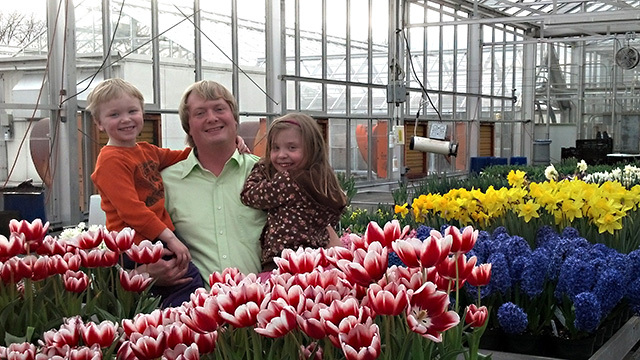 Mattson is one of 40 trailblazers under the age of 40 who exemplifies superior leadership, creativity, innovative thinking and accomplishments in and outside the horticulture field. Mattson’s GPN profile notes that he has authored or co-authored 27 peer-reviewed papers, 38 articles in trade journals, 30 newsletters and book chapters and delivered 160 extension presentations. His research program focuses on the influence of environmental factors and cultural practices on the physiology, development and biochemical characteristics of greenhouse crops. It’s wonderful that Neil’s talents have been recognized in this way—we at Cornell know what a great resource he is for all of us in Greenhouse Horticulture—he contributes so much to the whole Floriculture industry!